Where to Buy Micromax Coveralls, Micromax Tyvek Coveralls Disposable Spray Suit - $8.95 for Sale with Fast Free Shipping! Micromax Tyvek Coveralls Disposable Spray Suit with Hood, Boots (X-Large) is composed of flash spun high density polyethylene which creates a unique, nonwoven material. Superior microporous protection at a very affordable cost! MicroMAX from Lakeland Industries brings the most advanced microporous technology to the protective clothing market yet. This line of general purpose protective clothing can be used in any non-hazardous environment where dirt, grime, splashes and spills are present. The MicroMAX fabric is comprised of a microporous film with a nylon scrim between the film and substrate that gives the material additional strength. Tough can-do protection at a price that is sure to agree with your budget. 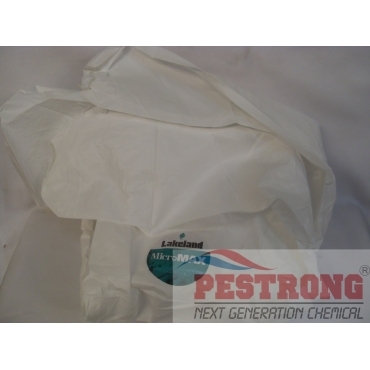 Micromax Coverall Disposable Spray Suit with Hood protect your clothing and skin from chemicals. Features full zip-up suit with long sleeves, pant legs and include boots. You stay cool and also resists tears punctures. One size fits most wearers between 5'7 and 6'2 in height and 150 to 220 lb. in weight. We do not carry this. you can purchase Tyvek coverall instead.